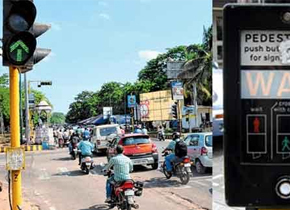 Bhubaneswar Smart City Limited has installed the first pelican crossing system in front of the Rama Devi Women’s University. Pelican is an automatic system, which allows pedestrians to have control over the zebra crossing. While crossing the road, they can turn the signal red by pressing a button. After their exit, the lights will be changed in the usual way. At present, the system is operational only in New Delhi. The corporation has identified the critical places where the traffic is heavy, and pedestrians face difficulty crossing the roads. The system will be a part of the modern traffic signalling system of the smart city mission. The plan is to have 13 more such pelican crossings at important places including road near BJB College, Ice Factory Road, VITS, Ashok Nagar Bus Stop, south and north of Master Canteen Squaren, road near Unit IX, Keshari bus stop, Press Club road, East Coast Railway office, KIIT, Satabdi bus stop and the Steward School.